The truth is: Belonging starts with self-acceptance. Your level of belonging, in fact, can never be greater than your level of self-acceptance, because believing that you’re good enough is what gives you the courage to be authentic, vulnerable, and imperfect. I recognize that the word “spirituality” can cause some people to squirm. To be clear: when I refer to spirituality, I am not solely referring to religion. Sure, many people define spirituality by their religion, and that works for them. For others, tapping into spiritual well-being can happen outside organized religion. Numerous people feel a sense of spiritual well-being being in nature. One youth I worked with expressed he tapped into his “sweet spot” [spiritual well-being] when zooming around on his skateboard. Church, temple, synagogue, forest, seaside, skateboarding, art, Yoga, dancing, music, running, swimming, biking, meditating, and countless other activities, environments, or pursuits can enhance spiritual health. An occurrence that I have experienced with Self and others is the profound transformative effect of Acceptance in one’s life, and how it can be the birthplace of spirituality. Sounds simple in theory – accept yourself where you are at, right? In actual practice, Acceptance requires us to shine a light on all that crappy stuff we have been avoiding, numbing, suppressing. Not desirable or easy. Oftentimes despair and anguish arise at the commencement towards Acceptance. Providing one is steadfast in staying on the journey of pain and anguish, something else begins to emerge. Elizabeth Lesser, best-selling author and co-founder of the Omega Institute refers to this as being “Broken Open”. Clinical psychologist, lecturer and founder of the Insight Community, Tara Brach, refers to this “something else” as “Awakening from the Trace”. So, what is the magic that emerges from the pain? Some view it as loving awareness. Others define it as embodied self-compassion. Brach (and others) calls it “Radical Acceptance”. It’s as though just when one’s psyche feels it cannot bear the pain any longer, an openness develops. It’s raw and profoundly vulnerable. Something transformative occurs when one’s internalized shame and debilitating inner-critic starts to get drowned out by tenderness and acceptance of Self. This is what leads to what some people refer to as “self-actualization”. You may be thinking, “Phew, that may be all fine and well for other people, but good luck me trying to arrive at that place!”. I believe that we all can. Truly. Sometimes it takes several attempts (it did for me) and reverting to long-entrenched maladaptive coping behaviours may be part of one’s process. That is okay. While the bulk of the spiritual “heavy lifting” rests on the individual, one often still needs to seek the supports of others. 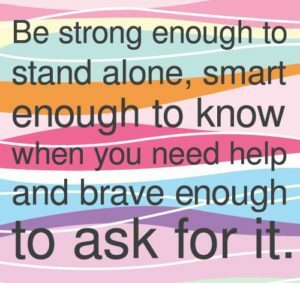 If you are struggling with self-acceptance, help is available.